Full Frame: Blimey! That Be Yer Last Harpoon, Sire. Blimey! That Be Yer Last Harpoon, Sire. In November 2016, the Royal Navy ( RN ) made it to the news headlines for the wrong reason - its frigates and destroyers will soon be running out of anti-ship missiles ( AShM ), all because of lack of funds complicated by poor planning, and perhaps as a consequence of having feeble-willed Sea Lords at the helm. The fleet is scheduled to have its helicopter-launched Sea Skua AShM going out of service in March 2017 AND have its Harpoon ship-to-ship missile withdrawn from service at the end of 2018 without any planned replacement. The untimely retirement of the Harpoon and the Sea Skua will cause the RN to have a capability gap in over-the-horizon anti-ship warfare between 2018 and 2020. The warships will regain some form of long range strike capability only in late 2020 with the planned introduction of the Anglo-French Sea Venom / ANL lightweight AShM on the Wildcat HMA.2 helicopters. Now wait a minute. Did anyone mention THE Royal Navy? I would have very much wanted to believe that it was an April Fool's joke of some sort, only it ain't April. Nobody would have been surprised if this debacle had involved a third rate navy of some Banana Republic. But it had to be the RN, of all navies? This piece of news might have been incredible and shocking initially because we had come to know the RN as one of the most powerful navies in modern history. However, look more closely and anyone would have realized that the once mighty RN had been in constant decline for the past century, yes, century, not decade. The writing had already been on the wall for a long time. That the RN would soon be running out of missiles for its workhorse frigates and destroyers could mark the beginning of a terminal demise, a race to the bottom from which it might never ever fully recover. Read on to discover how the RN got itself into this latest mess which by the way is not its first and unlikely to be its last. The Royal Navy could trace its lineage of more than a thousand years back to the reign of King Alfred the Great ( AD 871 - 899 ) and earlier, although in those early beginnings it was not an organized force with dedicated fighting ships and men. More likely the flotilla was made up of a ragtag of requisitioned merchant vessels whenever the need arose, such as when the Danes invaded or raided the Anglo-Saxon lands. The ships carried militiamen, farmers and peasants called into military service by law and much of the naval battles were ramming attempts followed by savage hand-to-hand fighting when the soldiers board the enemy ship. King Alfred was credited for reorganizing the military and restructuring the taxation system which would ultimately devote funds for ship building, thereby creating a small standing fleet of longships that plied the rivers, estuaries and the coastal waters of Englaland. From such humble beginnings the RN gradually transformed itself into a professional maritime fighting force, built upon centuries old traditions and technological innovations. The Battle of Trafalgar depicted by English marine painter Clarkson Frederick Stanfield. Vice Admiral Horatio Lord Nelson, by Lemuel Francis Abbott. It was the world's most powerful navy for much of the past 200 years, from the Battle of Trafalgar in 1805 to the Battle of Jutland in 1916. 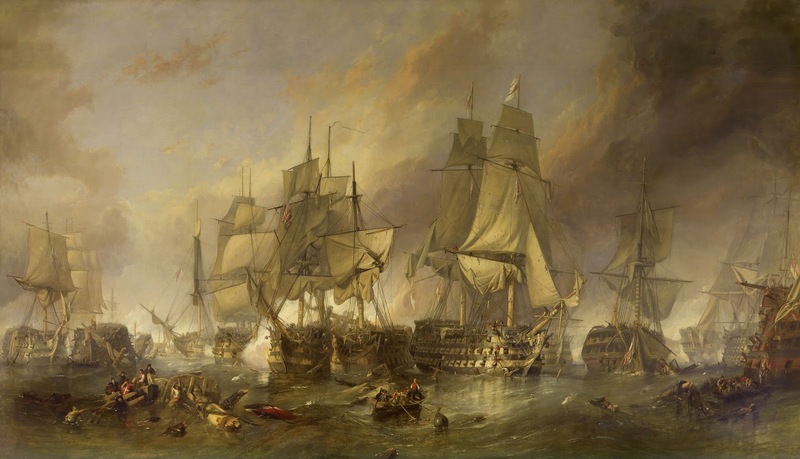 It was said that for a hundred years after the Napoleonic Wars, the Royal Navy maintained a presence in every ocean in the world and its dominance ensured freedom of navigation and trade. 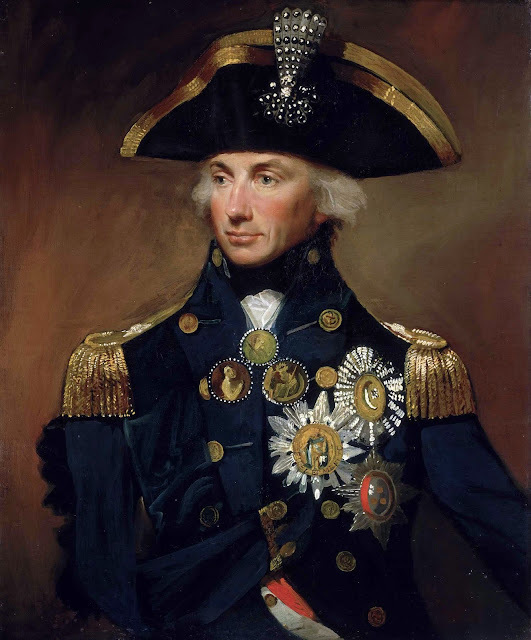 A powerful navy was a necessity during the colonial era as Britain depended heavily on maritime trade for much of its prosperity and even survival. Its supreme dominance helped shape the British Empire and its colonies and only came to an end during World War Two, overtaken by the United States Navy (USN). Even to this day, the RN is still the second largest navy of the NATO alliance, complete with aircraft carriers ( under construction ), helicopter carriers, amphibious landing ships, nuclear-powered attack submarines, ballistic missile submarines and the works. The price to pay for maintaining its nuclear deterrence force and aircraft carriers was that its destroyer and frigate force had shrunken to a historical low. The RN could only count six modern but problem plagued Type 45 air defense destroyers and thirteen ageing Type 23 ASW frigates at its disposal. Unless you are stuck in a time warp somewhere in the first half of the twentieth century, you would have realized that guided missiles have long since replaced large caliber guns as the primary long range strike weapon of choice for warships. In that bygone era, the main guns of battleships had barrel diameters of 14 inch, 16 inch and ultimately 18.1 inch ( 460mm ). The larger the caliber, the longer the range of the gun. The biggest guns could fire projectiles that weigh more than a ton out to a maximum range of 42km, though the effective range is a little less at 25km. It was the reach of the big naval guns that determined which opponent would fire the first salvos during a surface encounter. And you would have a better chance of victory if you could achieve that way before you in turn come into the range of your enemy's guns. However, the caliber of naval guns could not defy the laws of physics and keep increasing forever. Bigger caliber shells generate higher over-pressures when detonated which in turn would require a thicker barrel to withstand that pressure. Gun barrels are made of steel and steel has a high density, meaning it is heavy, in fact very heavy. Heavy barrels would require even heavier gun mounts which needed even bigger ships and bigger shipyards for their construction. And then there would be the cost factor. Each gun mount of the Japanese battleship Yamato with triple 18.1 inch barrels was said to weigh 2510 tons, about the same weight as an entire destroyer of that era. And the Yamato, a 72000 ton monster of a battleship, sported three such gun mounts. Clearly, naval architects would have to look elsewhere other than cannons and guns if they wanted to increase the strike range of their warships. That breakthrough arrived in the form of jet propulsion and rocket propulsion technologies that came of age during World War II. Though not exactly new especially with gunpowder having been invented by the Chinese in the 9th century and presumably used as a rocket propellant subsequently, the emerging sensor and guidance technology of WWII saw application in the earliest generation of guided missiles and rockets like Nazi Germany's V-1 cruise missile and V-2 rocket. By the sixties, fueled by the Cold War, missile technology had rapidly matured permeated every branch of the military including the navies of many nations. With their superior range, accuracy and lethal payload, they quickly rendered the big guns obsolete in anti-surface warfare ( ASuW ). The effectiveness of anti-ship missiles as ship-killers was first demonstrated in 1967 when the Egyptian Navy Komar-class missile gunboats sunk their much bigger opponent the Israeli destroyer INS Eilat with three Soviet made SS-N-2 Styx AShM. Ever since that first operational success, the role of guided missiles as the premier long range precision anti-ship weapon of choice was further affirmed during the Falklands War in 1982 when a single Argentinian air-launched AM-39 Exocet AShM sunk the Royal Navy Type 42 destroyer the HMS Sheffield. Today, while warships of many types are still equipped with guns, these weapons have seen their prominence diminished and their caliber much reduced. The largest guns found on modern day man-of-war generally do not exceed 5 inches in caliber ( 127mm ). They still have limited use especially against low value targets that are not worth expending a missile on, for shore bombardment in support of an amphibious landing and some rapid firing types may also have anti-aircraft capabilities. Of course they can also be used to fire ceremonial rounds and the occasional warning shot across the bow against rogue elements if necessary. 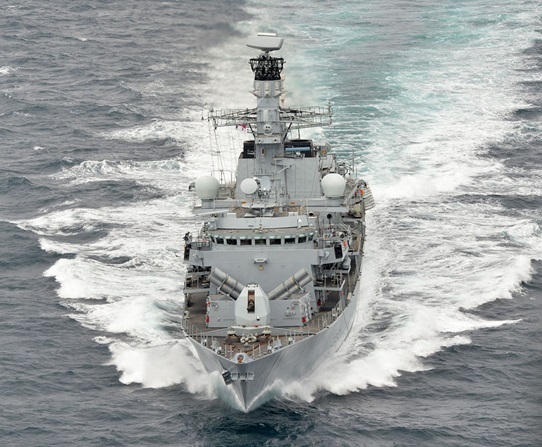 The main class of warship affected by the RN's missile fiasco is the Type 23 frigate, also known as the Duke-class frigate as, you guessed it, the entire class is largely named after British dukes. Frigates form the backbone of the navy as they are the multi-role platform that are involved in anything from submarine hunting to patrolling and escorting duties and even in providing limited area air defense against hostile aircrafts and missiles. In recent years, many were also increasing tasked to conduct peace-keeping and maritime security operations as well. The Type 23 was conceptualized at the height of the Cold War in the late seventies as a light anti-submarine frigate against the Soviet nuclear submarines operating in the North Atlantic. They were intended to replace the ageing Leander-class and the newer Type 21 frigates to be the new guardians of the famed GIUK Gap, the strategic underwater choke point for any Soviet Northern Fleet submarine trying to breakout into the Atlantic Ocean from their home bases around Severomorsk. In its original configuration, the Type 23 was to have a towed array sonar and carry an ASW helicopter to attack enemy submarines that it had detected. It would not be mounting any defensive armaments and was supposed to instead rely on the Sea Wolf missile system from its replenishment oiler for protection! In addition, it was intended that the Type 23 frigate would only have refueling and rearming capabilities for its helicopter and had to rely on the same oiler to provide servicing facilities. It was with great fortune that the Falklands War broke out in 1982 before the plans for the Type 23 were finalized. The RN would have otherwise ended up with an entire class of lame ASW frigates that cannot operate independently even in low threat environments. Lessons learnt from that conflict included among other things the deadliness of aerial attacks even with unguided iron bombs, the astonishing ship-killing capabilities of modern guided anti-ship missiles and the need for an effective point defense system for self-protection. It was back to the drawing boards ( literally, since computer aided design technology was not available then ) and the future frigate grew in size, complexity as well as cost. The Type 23 frigates were to eventually have new technology incorporated into their design like the radar cross section reducing stealth technology, extensive automation to reduce manpower requirements and enhanced damage control capabilities. Instead of relying on their oiler to provide an air defense umbrella, they would have their very own Sea Wolf surface-to-air missiles, a total of 32 missiles packed in a new vertical launch system ( VLS ) at the forecastle just aft of the main gun. That was in conjunction with additional tracking capabilities against low flying aircraft and sea-skimming AShM. A single 4.5 inch ( 127mm ) medium caliber main gun would be mounted to provide naval gunfire support. Smaller caliber guns like the 30mm autocannons and general purpose machine guns would also be mounted in greater numbers for self defense against small boats and aircraft. A set of Harpoon AShM in two quadruple launchers mounted just aft of the Sea Wolf VLS would provide long range strike capabilities against surface targets. A combined diesel-electric and gas ( CODLAG ) propulsion system would provide for very quite running during ASW operations and yet have the economy of an extended range and the power for a high speed dash whenever the need arose. The frigate would also have a flight deck and an enclosed hangar that was self-contained. The embarked Lynx or Merlin ASW helicopter would be armed with the Sea Skua AShM or torpedoes. In May 2015 the RN made the decision to replace the GWS 26 Mod 1 Sea Wolf surface-to-air missile of the Type 23 frigates with the naval variant of the Common Anti-Air Modular Missile ( CAMM ), also known as the Sea Ceptor. The Sea Ceptor has a range of more than 25km which is almost thrice that of the Sea Wolf. It could be packed four to the space occupied by one Sea Wolf missile in the VLS. The missile system utilizes much of the existing infrastructure of the Sea Wolf system but a much more powerful Type 997 Artisan 3D radar is required. HMS Argyll was the first frigate to be upgraded in late 2015. Ultimately, these tired workhorses of the RN which have been in service for almost three decades now will be replaced by eight Type 26 ASW frigates a.k.a. Global Combat Ship some time after 2021 and perhaps by the lighter and cheaper Type 31 General Purpose Frigate in the far future. This is the other class of warship which are equipped with the Harpoon missile in the RN. There are six of these Anti-Air Warfare ( AAW ) destroyers serving in the RN whose primary role is to provide area defense for the fleet against hostile aircrafts and AShM. They were meant to replace the fourteen ( twelve, if not including HMS Sheffield and HMS Coventry which were sunk during the Falklands War ) Type 42 Sheffield-class destroyers. The first in class HMS Daring was commissioned in 2009 while the last ship of the class HMS Duncan was commissioned in 2013 just as the last of the Type 42 was being decommissioned. Central to the Type 45 AAW destroyer is the PAAMS ( Principal Anti Air Missile System ) or Sea Viper air-defence system which utilizes the SAMPSON active electronically scanned array ( AESA ) multifunction radar and the S1850M long range radar. They are armed with Aster-15 and Aster-30 surface-to-air missiles in a 48-cell Sylver Vertical Launch System. The Aster missile is essentially an anti-missile missile capable of intercepting inbound super-sonic anti-ship missiles as well as precision guided munitions. 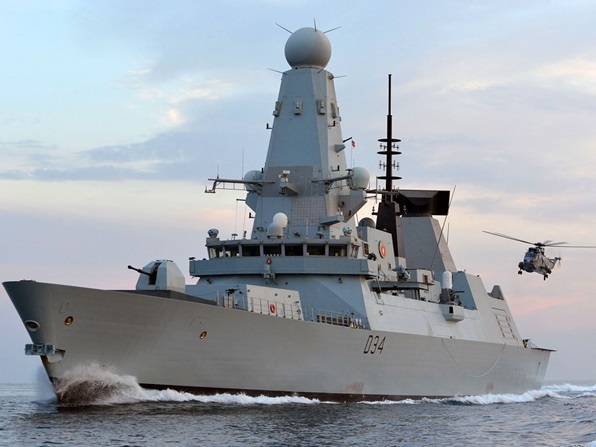 The Type 45s are each equipped with a 127mm main gun, two Oerlikon 30mm guns, two Phalanx CIWS, two Miniguns and six general purpose machine guns. They have a large flight deck and an enclosed hangar and can carry up to two AgustaWestland AW-159 Wildcat or one Westland Merlin helicopter. The Wildcat can be armed with four Sea Skua AShM or two torpedoes while the Merlin carries no Sea Skua but four torpedoes. As they are primarily air-defence destroyers, the Type 45s were originally not meant to be armed with any AShM. 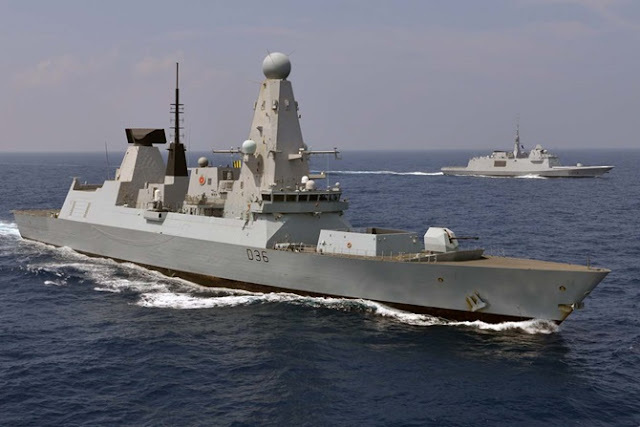 However, plans had been formulated to have the Harpoon anti-ship missile system retrofitted onto four out of the six Type 45 destroyers and the integration process had already been completed on three ships so far ( HMS Daring, HMS Diamond and HMS Duncan ). To understand why only four ( maybe just three from now on ) of the six Type 45 Daring-class AAW destroyers were planned to be equipped with Harpoons, we need to go further back in history to look at a previous class of ASW frigate that had long since retired, the Type 22 Broadsword-class. The RN's fourteen Type 22s were procured in three separate batches over a period spanning eleven years between 1974 and 1985. Each succession batch was an improvement over the previous one. The first ten Batch 1 and Batch 2 ships were ordered before the Falklands War and were equipped with the Exocet AShM. The last four Batch 3 frigates were ordered after the conflict and incorporated the more advanced Harpoon AShM. The Type 22 Batch 3 frigates were all decommissioned in 2011, just shortly after the commissioning of the first Type 45 destroyer in 2009. 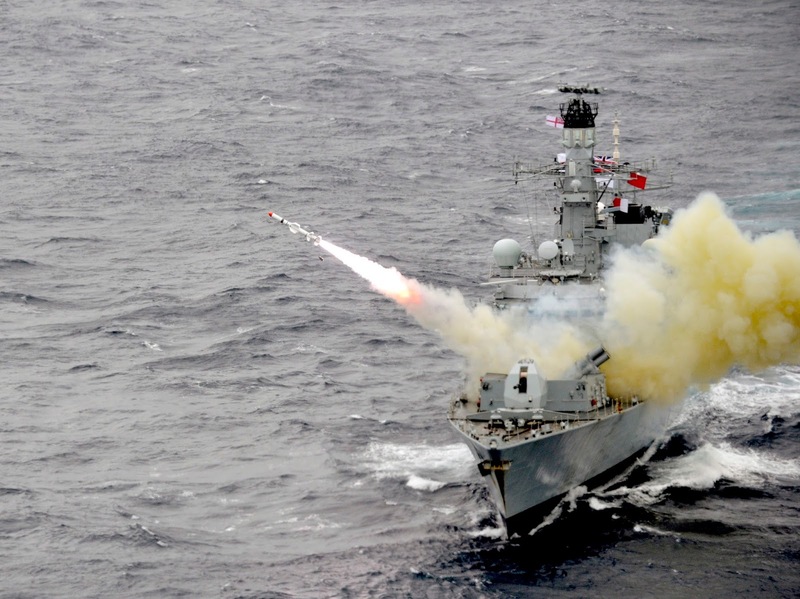 It seemed that some admiralty brass retrospectively decided to salvage the Harpoon missile system from the decommissioned frigates and mount them on the Type 45 for added anti-surface warfare ( ASuW ) capabilities. While I have generally do not have an issue with the reuse and recycling of old equipment especially if they are still in good functioning order, to install an obsolete AShM system on a brand new destroyer for the mission critical purpose of taking out the surface fleet of your enemy at stand-off range may not be the smartest move. The development of the Harpoon missile started as long ago as the mid sixties and was at the cutting edge of technology when it was first deployed in the eighties. 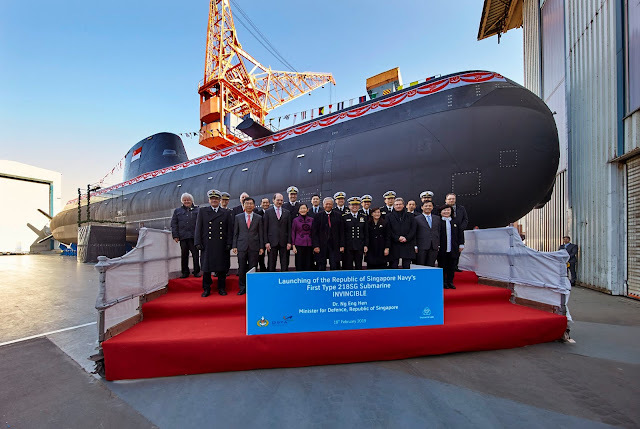 However, after more than three decades and no matter how many improvements had been made to each successive variant including the latest Block II Harpoon, the entire family is facing obsolescence with the emergence of whole new generations of long range super-sonic anti-ship cruise missiles from Russia, India and China. We shall now take a closer look at the RN's Harpoons and Sea Skua missiles. 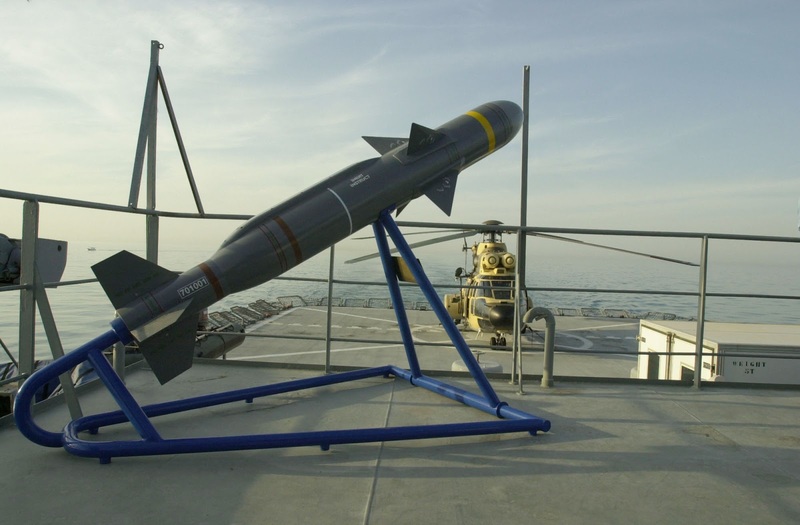 The RN has only two types of AShM in its inventory - the Boeing Harpoon missile and the MBDA Sea Skua missile, both of which are ageing and obsolete. The Harpoon is an all-weather, beyond-the-horizon, anti-ship missile that was developed and manufactured by McDonnell Douglas ( now Boeing ). It was first introduced into service in 1977. To date, there are several versions that could be launched from different platforms such as aircrafts, warships, submarines and costal batteries. Both the Type 23 frigates and three out of the six Type 45 destroyer are equipped with the GWS60 Harpoon AShM, essentially a Boeing RGM-84D Block 1C Harpoon ship-to-ship missile. The Block 1C Harpoon is an early version that was introduced in 1985 and equipped the US military and its allies. It is hopelessly outdated by today even by the USN's own standards, superseded by newer variants like the littoral warfare capable RGM-84L Harpoon Block II. It would fair even poorer when compared with foreign modern AShM like the ramjet powered supersonic BrahMos ( 290km range ) or the future hypersonic BrahMos II. The Block 1C Harpoon has a maximum range of 130km and carries a 220kg high explosive - fragmentation warhead, considered a heavyweight in anti-ship missiles, enough to sink a frigate-sized warship. It has a long cylindrical body that measures 4.63m in length and 0.343m in diameter with a wingspan of 0.9m. It weighs 690kg and is propelled by a solid fuel rocket booster during launch and then followed by the Teledyne J402-CA-400 turbojet that enables it to cruise at the sub-sonic speed of Mach 0.9 at wave-top level. The missile depends on inertial navigation to reach its pre-designated target area and then switch to active radar homing for terminal guidance. Block 1C upgrade brought with it an increase in the missile's range and allows the operator to have programmable waypoints, selectable terminal flight profile ( whether to pop up from sea skimming during the final part of the flight path ) and improved electronic counter-countermeasures ( ECCM ). The Mk 141 quad-packed Harpoon Guided Missile Launching System. 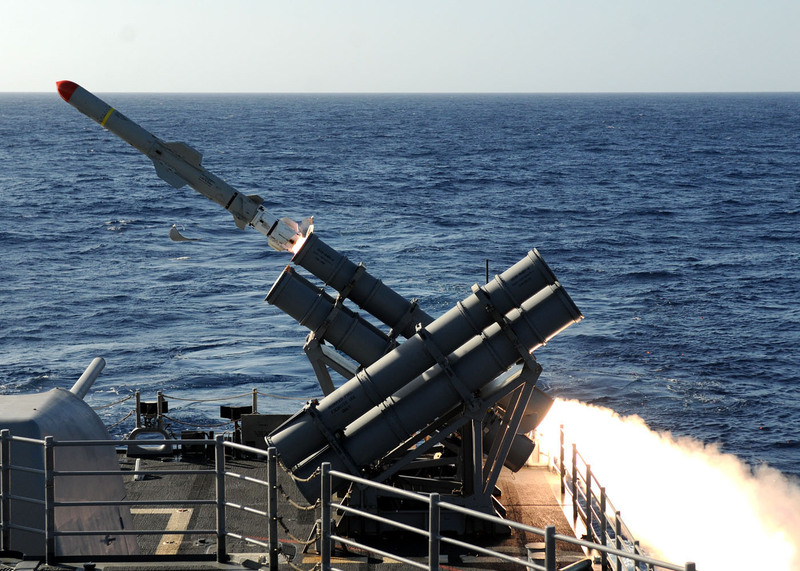 The Harpoon missiles are packed in sealed canisters and stacked 2 x 2 in a quad-pack rack-mounted launcher known as the Mk 141 Guided Missile Launching System. Each ship usually has 2 quad launchers angled at about 45 degrees skywards and facing two opposing directions. In older and less stealthy ships like the Type 23 frigates, these canister launchers would be placed on the upper deck areas anywhere from the forecastle ( Type 23 ) to midship to the quarterdeck ( Ticonderoga-class CG ) areas. In modern stealth designs like the Formidable-class frigate of the Singapore Navy, the Harpoons are usually mounted midship out of sight behind high panels that shield the angular and protruding shape of the launcher from radar detection. The active radar homing terminal guidance of the Harpoon missile meant that it is best used against warships in the open ocean far from any surrounding land masses that could lead to the interference of radar clutter. It would not perform well in a littoral environment nor would it be effective around busy sea lanes with lots of innocent maritime traffic as the seeker could home in on the wrong target. It is important to remember that imperfect and obsolete as it is, the Harpoon missile still packs a greater punch and has a further reach than Sea Skua missile and the 5 inch gun of the Type 23 and Type 45 warships. However, repeated cuts in defense budget of the United Kingdom in the past decade have ensured that there wasn't a Harpoon replacement program in sight even as the Harpoons were slowing rotting away. Apparently the decision to abandon the Harpoon missile has been made by the Ministry of Defense as far back as 2010. Its eventual replacement may only come a decade later in the form of a future vertically launched heavy-weight AShM onboard the Type 26 Global Combat Ship. 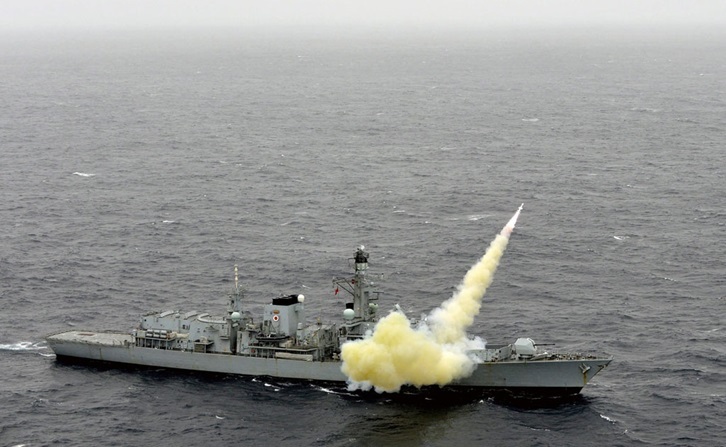 Rather than facing a ten year capability gap in long range anti-surface strike, the RN could have elected to continue the maintenance and usage of the Harpoon missile until such time its replacement is available. This would probably be the cheapest option. 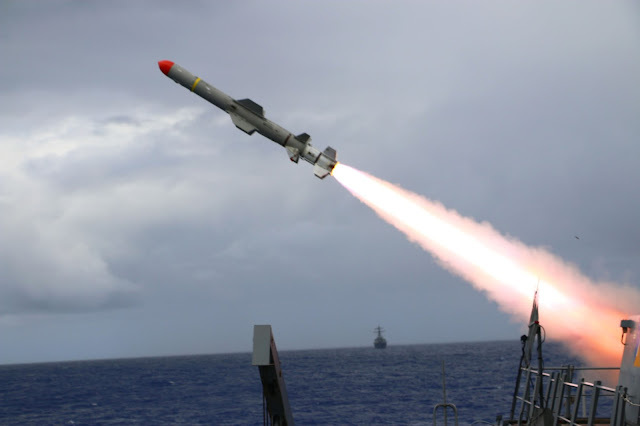 Other options include upgrading to newer variants of the Harpoon like the extended range Harpoon Block II+ ER or some other advanced AShMs like the Kongsberg Naval Strike Missile. These upgrades can then be transferred to the Type 26 when the Type 23 frigates are decommissioned. 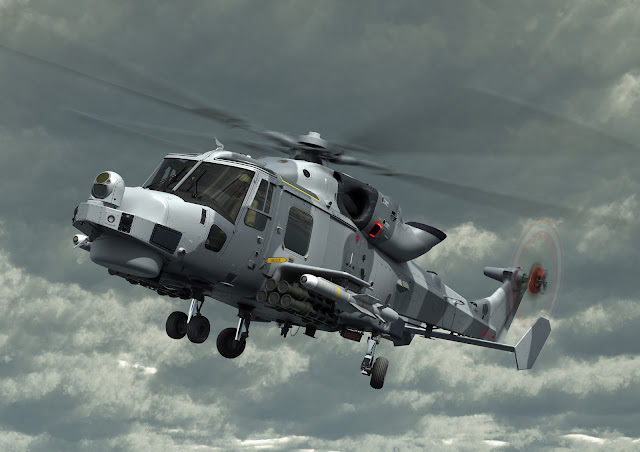 The Sea Skua is a British light-weight, all-weather, short range, sub-sonic sea-skimming AShM that is primarily launched by the Westland Lynx helicopter although variants could be launched from warships and coastal batteries. It was developed by the British Aircraft Corporation in 1972 and entered service with the RN in 1982, just in time to participate in the Falklands Conflict where it performed well, scoring seven hits out of nine missiles fired. Two Argentinian patrol crafts the Alferez Sobral and Rio Iguazuwere severely damaged with loss of lives and an abandoned cargo ship the Rio Carcarana was sunk. During the 1991 Gulf War, all the Sea Skuas that were fired hit their Iraqi targets and were credited to have disabled or sunk a total of fifteen patrol vessels and landing crafts. The Sea Skua missile weighs 145kg at launch and carries a 28kg blast-fragmentation warhead or a 9kg semi-armour piercing warhead. 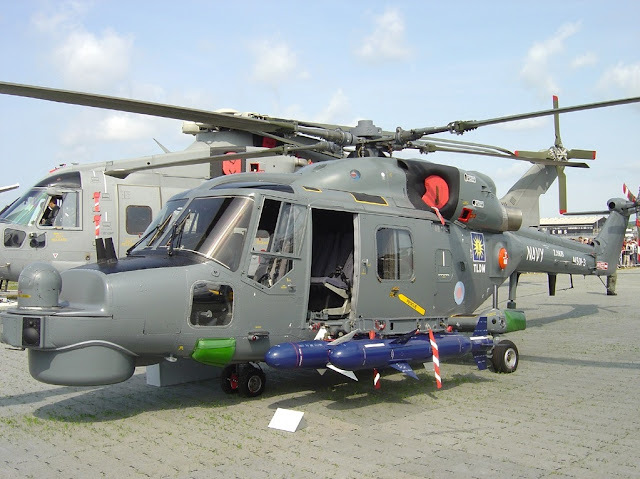 A total of four Sea Skua missiles could be carried by each Lynx naval helicopter. It has an officially acknowledged range of 25km though it is widely believed to have a much further effective range. The guidance system is semi-active radar homing. When launched, the missile could be programmed to fly, depending on the sea state, at four pre-determined altitudes above the waves with the assistance of a radar altimeter. As it races towards its target at a high sub-sonic speed of Mach 0.8, it performs a pop-up maneuver to acquire the target which would be illuminated by the Lynx helicopter's Ferranti Seaspray radar. A Royal Malaysia Navy Super Lynx 300 with Sea Skua missiles circa 2004. Operation Enduring Freedom 12th Mar 2002. USN Photo. Although the Sea Skua had an impressive operational history, its Achilles' heel was its relatively short range and its small warhead. 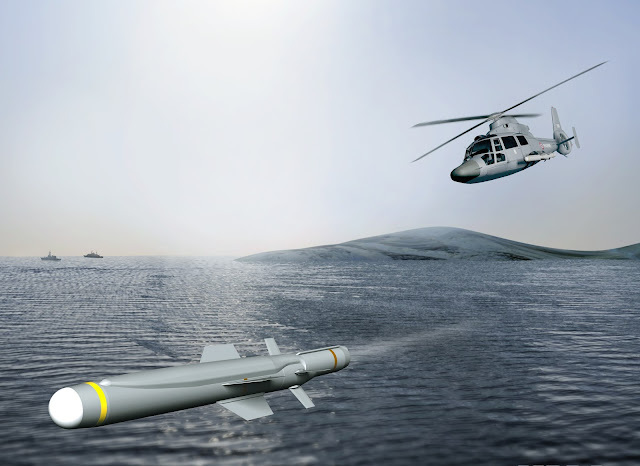 As the range of modern ship-borne anti-air missiles increased over the years, so has the stand-off range for any naval helicopter to launch its AShM without getting itself into harm's way, meaning the range of its AShM has to be correspondingly increased. The Sea Skua is already obsolete in that sense. Its feather-weight warhead also meant that it could only be effectively used against warships of low tonnage or else multiple direct hits have to be scored to disable a bigger vessel. Therefore after an illustrious service of close to 35 years with the RN, the admiralty had decided to retire the Sea Skua missile by March 2017. The unfortunate thing is that the Sea Skua's successor, the MBDA Sea Venom / ANL missile system is still in its final development and will not see service until at least sometime in late 2020, that is if things happened on schedule which is rarely the case. AugustaWestland AW159 Wildcat HMA2 helicopter. fired from what looks like a French Navy AS565 Panther helicopter. Looking at what is currently happening to the once proud Royal Navy, without any fleet carriers, may not have F-35Bs to populate the carriers even when they are commissioned in the future, with frigate and destroyer numbers at an all time low, and with them about to lose all of their long range anti-surface strike capabilities, one cannot help but wonder what are the possible consequences that could arise out of this almost criminal neglect of the navy. 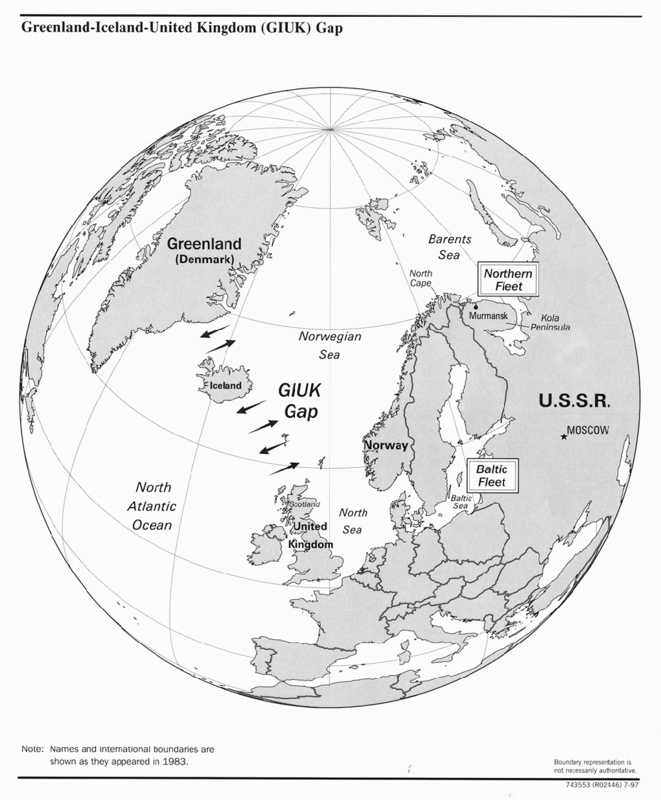 To start off with, the RN may not be able to fulfill its obligations to NATO as the guardian of the GIUK Gap to contain the Russian navy in the North Atlantic. Without long range heavy-weight AShM, the frigates and destroyers will simply be sitting ducks that can be taken out by their Russian counterparts from stand-off distances without having a chance to strike back. 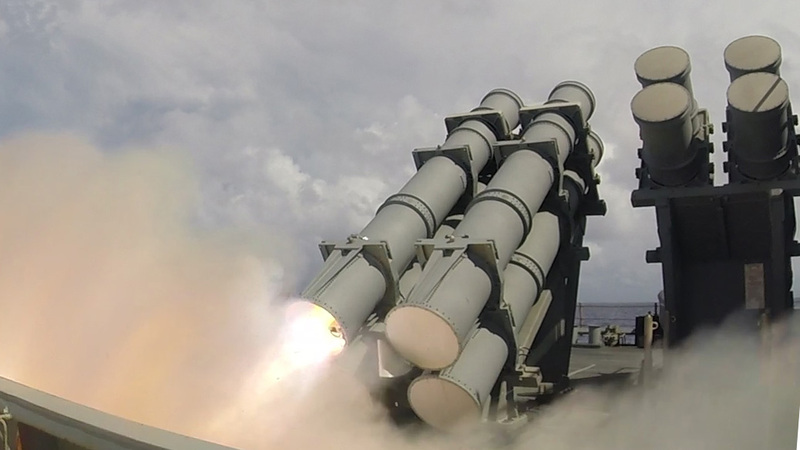 No doubt the newly installed Sea Ceptor anti-air missiles might protect the ships but they are purely defensive in nature and the enemy only has to be lucky for once and you are dead. And nobody could win a war by purely defensive moves! The other issue with a weakened RN is its capability to uphold the United Kingdom's sovereign claim on the Falkland Islands. As we all know, the Argentinian government had never given up its claim on the Falkland Islands even after narrowing losing the Falklands War in 1982. Had they been able to sink one of the aircraft carriers or the Fearless-class amphibious assault ships instead of the Type 42 destroyers and Type 21 frigates, the war would have had a very different outcome. Today, with the light carriers decommissioned and their Sea Harriers retired, Vulcan bombers long gone, and the shrunken surface fleet that will soon be stripped of their AShM, the UK will not be able to mount a similar expeditionary force to the South Atlantic should the Argentinians decide to cause trouble. All these cost cutting moves taken by the British MOD in the past decades could only be viewed as a lack of resolve to enforce Crown sovereignty over the Falkland Islands, just as the decision to decommission the aircraft carrier HMS Hermes and the planned withdrawal of the Antarctic Survey Ship HMS Endurance from the South Atlantic did in the early eighties. Also, as the United States become increasingly inward looking with the new Trump Presidency, the UK may not necessarily get all the assistance they enjoyed previously from their once staunchest ally during the Falklands War, like the intense diplomatic brokering, the massive support within the Security Council of the United Nations, timely military intelligence and emergency ordnance resupply using borrowed NATO stockpiles. 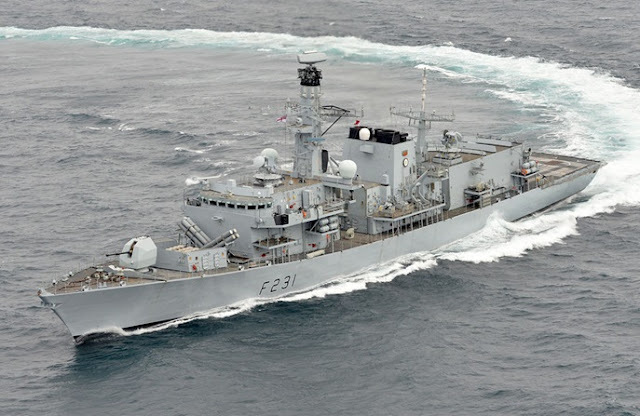 If the lack of funds was the reason why the Harpoon and the Sea Skua systems are to be removed from service prematurely, I would suggest the UK MOD not to upgrade the Sea Wolf system of the Type 23 frigates and instead use the GBP 253 million or so that they have spent on the Sea Ceptor to maintain the older missile systems for another few years, until a suitable replacement can be put into service. Sir Michael Fallon should seriously ask himself this before he retires the Harpoon and the Sea Skua : Would the Junta view the year 2019 or 2020 as the best time for another Argentinian invasion of the Falkland Islands? Does the UK wish the Falklands to be renamed the Islas MALVINAS, again, ever? Or never again? Tough choices indeed. God save the Queen ... and the Royal Navy. The RSN will soon celebrate its 50th anniversary and will commission rss independence i wonder how is the progress of the 218 subs? There is also the specialised marine craft they have been testing for a long time and the venus unmanned surface vessele. Besides that there is the aster30, a330mrtt, next generation AFV, H225M carnals, ch47f. Hi u have not posted for a Long while. Will u be back? Yay. I like your posts alot. Lots of details:) i like those blogs especially those on south east asia. Lots going on lately. Basically, Britain wants a military but doesnt want to pay for that mi,itary, simple as that. Whaat the Royal Navy is hoping is that in wartime, the treasury can and will release emergency funds for missile purchase, at which point they ring up the USN and go "brader, borrow me some Harpoon, nanti i pay you back" and the USN goes "ok no prob, steady brader." Another example of a thaitanic but this time an airship. Also the Brits are having a fire sale selling many hardwares. They seem to need money urgently. The F35Bs and their carrier cost them too much i guess? ?